So we thought here at Wordtracker we’d do the opposite and make much more data available. Most keyword tools generate keyword data from the Google Keyword Planner. We also show Google data as a source within our keyword tool as well. Changes that are made in the keyword planner will eventually filter through to keyword tools which use keyword planner data. This shouldn’t be a problem, however Google has made a few changes to the keyword planner and those changes haven’t been too welcomed. This is because they are now showing less and less keyword data, this has been especially the case for those looking to use the data for SEO. What the Google Keyword Planner results now look like. Google have decided that they don’t actually need to show all the keywords they have available in the planner for any given search. Meaning that searches which used to return multiple keywords within individual searches now return one result with the search data combined. You have no way of knowing either if the keyword you are looking at is grouped or not. So for instance if you were to search for ‘trainers’ you will see the combined volume of that term as well as ‘trainer’. Moz also has done some great research on this, making the case that just because the keywords are grouped doesn’t mean the search results will be the same for those terms. Search Engine Land points out that what we see in the keyword planner can only be used as an indication. Google has always banded the results you see in the keyword planner. This is because they don’t actually show the number of searches a keyword has. Instead they work out the number of searches from a sample and then scale this up to give the numbers they put in the planner. As an artifact of this process volumes were always provided in bands, so lots of keywords had the same volumes around certain numbers. This was generally ignored as there were lots of bands so it was still reasonably accurate. However this isn’t the case anymore. In other words, pretty useless. You can’t do any real optimisation work based on the these figures as the bands are so broad. 1K - 10K meaning 1000 to 10,000 searches for a keyword is not enough information and makes picking which terms to optimise for which all fall in the same band a game of pot luck without another data source. there is a wide range between 1,000 and 10,000 for those doing keyword research. But for overall totals, showing 100,000 to 1,000,000 total would be fairly useless for anyone using these numbers for research reasons. Less accurate data is less useful, we can all see how it will affect trying to use data from the Keyword Planner for SEO. You get limited results you can’t actually trust. We have never shied away Wordtracker data being from an entirely different source to Google’s data. Ours comes from a separate search engine network. However, unlike Google, we don’t scale ours up. After filtering out spam we leave the data pretty much as is, fiddling with it as little as possible to give you access to the raw data. However we decided that we should take the step of introducing Monthly Average search volumes, which is how data is shown in the planner by default, to make up for the shortfalls in Google’s keyword data. Using the broadest setting in the Keyword Planner gives the most results, however it includes lots of terms which is just related to the keyword. Rather than including the term itself. This can be useful at times. We include those results seperately within the related terms and allow you to add those to the search as you see fit. Comparing like for like using the "Only show ideas closely related to my search terms" setting in the Keyword Planner returns even fewer results. We are also working on how we can include closely related terms within the results where there are mispellings or very long tail searches where this data would be most useful. One of the restrictions we have within the tool is the limitations provided by the browser, for lots of searches we now have well over the 10,000 keywords we return within Gold plans. However once we start trying to display more than this the time the data takes to load becomes too long. There are then problems with the filtering and using that data in the tool. 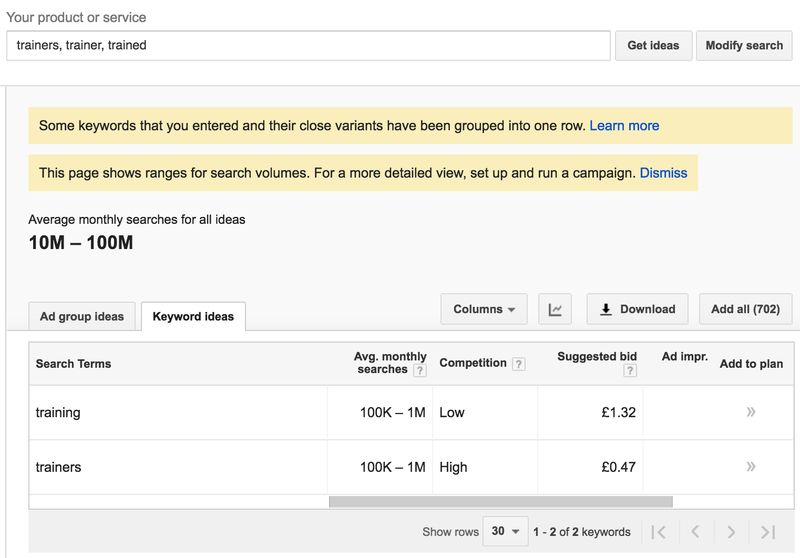 This is a problem the Keyword Planner doesn’t have, displaying a maximum of 700 - 800 results. We return well over 10 times this for many searches. Wordtracker is built for Keyword research and designed so you can get the keywords you need for search engine optimisation.